Dr. Kalyanasundaram and Sanjay Mittal – Richmond Fellowship Society of India, eHealthObjects and Kairav Health collaborate. The Richmond Fellowship Society – India (RFS) founded in 1986, a non-for-profit organization providing care and psychosocial rehabilitation services for persons with mental health needs, has signed an MoU with eHealthObjects, a US-based health technology company focussing on improving quality of healthcare, reducing costs and improving outcomes. A first-of-its-kind for the company, in terms of collaborating with an NGO, the focus of their collaboration is to enhance rehabilitation and management of persons with chronic mental illness. 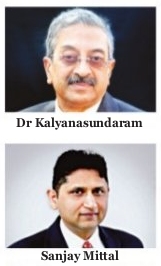 Dr. Kalyanasundaram, CEO, RFS (I) Bangalore and Sanjay Mittal, CEO, eHealthObjects, Inc. USA spoke to City Express about their association and how it will benefit patients. When did you think of going for eHealthObjects and their solution? Dr. Kalyanasundaram: We chose the company because it specializes in delivering healthcare technology products, solutions and platforms. Our mission is to provide our patients with the highest quality of mental healthcare in the most customized way. Ease of use of ThinkEHR, their solution, and its superior technical architecture, made it an easy choice for us. eHealthObjects is a health technology leader and I am very excited to bring their world-class solution to our rehabilitation centers. Can you elaborate on ThinkEHR? Sanjay Mittal: ThinkEHR v4.0 has been certified by INFOGARD, an ONC-ATCB – US Office of National Coordination, an authorized testing and certifying body – as the complete electronic health record technology for both inpatient and ambulatory settings. Known for its innovative technical approach, ThinkEHR offer a complete solution for long-term care centers, nursing homes, hospitals and other healthcare facilities. ThinkEHR’s mental and behavioral healthcare coordination, case management software, technology and platform will be used for the implementation at RFS to effectively manage screening, admission and in creating individualised treatment plans for patients with mental healthcare needs. Have you already launched the software? SM: We have started ThinkEHR implementation at Asha Halfway Home run by RFS, offering short-term residential mental health services to persons with chronic mental illness. After ThinkEHR is rolled out at Asha, it will be implemented in the other centers of RFS – Jyothi, a long term care centre and in Chetana, a day care centre which provides vocational training for those with chronic mental illness and mild mental retardation. The main idea is to integrate all the three facilities so that data of all the centers is captured, making it easy to search for them. By when do you plan to go live? Dr. K: At Asha, we plan to go live by this November or December while the other centers will go live by the first quarter of next year. Dr. K: Chronic mental illness affects about 10 percent of the population and one-third of them require long-term rehabilitation. The illness being long and rehabilitation being a continuous process, such a system that facilitates case management and data handling will ensure continually of care. Have you sought local expertise for the same? SM: To quicken implementation, we have partnered with Kairav Health India Private Ltd., a Bangalore-based health IT company. This partnership helps eHealthObjects to quickly scale up the local resources as needed.